Camp Staff Applications for 2019 are being accepted! Camp Staff Scholarship ApplicationStaff member are eligible to apply for a scholarship. Application will be available Summer 2018. Staff must be eligible and willing to be a registered member of the Boy Scouts of America. Counselor in Training (CIT I) – 14 years old by June 1 of the current camping season. Counselor in Training (CIT II)– 15 years old by June 1 of the current camping season. 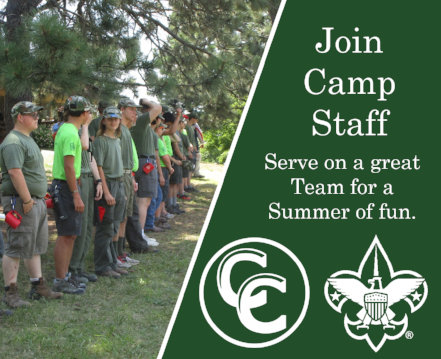 Directors / Counselors – 18 years of age or older by June 1 of current camping season. BSA standards require some positions to be a minimum of 21 years of age, by June 1 of current camping season. The principles of the Scout Oath and Law must be practiced as a way of life. Staff is expected to set the highest example of excellence in Scouting. Housing and meals are provided. Staff is expected to maintain living quarters properly and always be in attendance at mealtime. References are important and will be reviewed as part of the selection process. Have your references complete the enclosed forms and return them directly to camping services at the address listed below. Applicants under 18 years of age must have one reference form completed by their Scoutmaster. Apply at any time. However, applications received by December 1st will receive first consideration.